Hayat & Bros rosewood chair, Bali sculpture, Nike athletic shoes, Van Briggle ceramic porcelain, Brother Mathew tile art are currently available for your collection. Signed by well-known manufacturers items section. High quality and functional finds for accenting, collecting, or developing your style decor. Van Briggle early Art Pottery unusual heart shaped pitcher and cup or sugar bowl in small size set in pink color. BALINESE HAND CARVED FAIR TRADE FISHERMAN WOODEN STATUE SCULPTURE vintage art. Terrance Guardipee Mixed Media Ledger art 2001 Blackfeet Warrior Native American Original art. RARE Lou Zansky ON THE SLOPES large framed tile design stye mosaic art composition, rare find art. Brother Matthew, O.S.F. 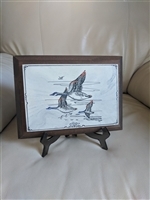 flying Ducks marble etching. KW sign, vintage 1/20 12k GF chain with 18K Pendant in rich gold tone and Aurora Borealis with 24K gold nuggets bazel accents and Onyx green back.